Post-traumatic stress disorder (PTSD) is a very serious mental illness, and depression is one of the major symptoms, along with stress and anxiety. PTSD typically affects people who have gone through a physically and/or emotionally traumatic experience, especially soldiers. As surprising as it may seem, more soldiers die from suicide than combat these days. 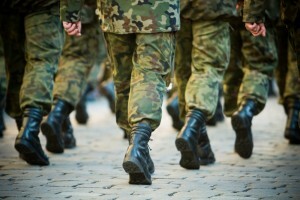 Depression amongst active duty soldiers and army veterans is at an all time high. Even one-quarter of the veterans who served over 20 years ago in Vietnam are still dealing with PTSD, and as a result experiencing high levels of depression. PTSD is a tough illness to battle, and even though the military is making huge strides to provide more mental therapy to their soldiers and veterans, the numbers are still increasing. However, if you are a veteran dealing with PTSD, there is hope. Meditation has now been proven to do wonders for people suffering from high levels of stress, anxiety, and depression. A study published in Archives of General Psychiatry found that meditation works as well as antidepressants as a preventative treatment for depression – i.e., preventing patients who have already been treated for depression from relapsing. The type of meditation used in this study was “mindfulness meditation” – training the brain to only focus on what’s happening in the present moment, without judgment – also known as, “mindfulness-based cognitive therapy” (MBCT). The patients who participated in the study practiced meditation for eight weeks, and at the end of the study showed positive results. Another study, which was led by Massachusetts General Hospital (MGH) researchers, and published in Psychiatry Research: Neuroimaging, revealed that MBCT can actually “rewire” the brain – make real, observable structural changes in the brain – and also aid as a combative tool against depression, stress, and anxiety. This study used magnetic resonance imaging (MRI) scans to see that real changes had occurred in the brains of the study’s participants. Like the study published in Archives of General Psychiatry, the MGH researchers had their participants undergo eight-weeks of regular MBCT training. This new scientific evidence just goes to show you that there definitely is hope for anyone dealing with PTSD and depression, including war veterans.